In short there were not that many great meals in the past couple of weeks. 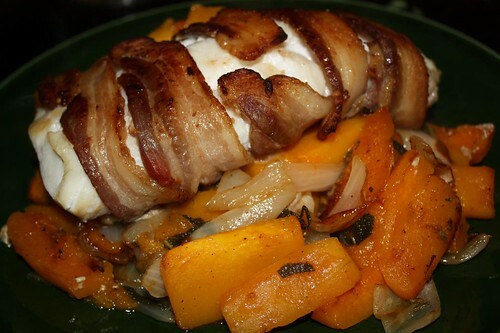 The only noteworthy thing I made was this bacon-wrapped cod loin. I wrapped it in bacon, roasted some cayenne-sprinkled pumpkin and onion in a pan, then tossed this in at the very end. It was a particularly fantastic piece of cod that didn't really need to be wrapped in bacon but like most things wrapped in bacon it did not suffer from the preparation. 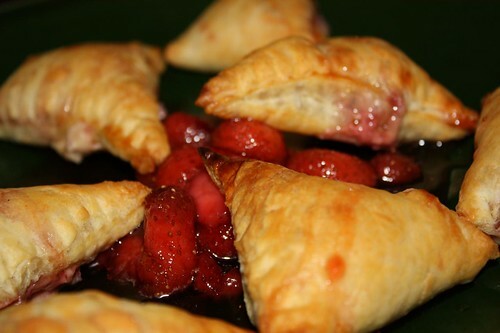 A friend I haven't seen in a decade sent me some of her famous strawberry empanadas which I baked in the oven. These is one of my favorite desserts from my restaurant past. It's even more favorite when sent to me, oven-ready, and free! As if that wasn't enough to give thanks for, there was another dinner looming on the horizon that Jen was going to singlehandedly prepare while I sat on my duff. Lo, there is a lot to give thanks for.